Euan took in events from the northwest United States and Canada – known in SCA circles as the Kingdom on An Tir. This included travelling around British Columbia, Washington and Oregon. 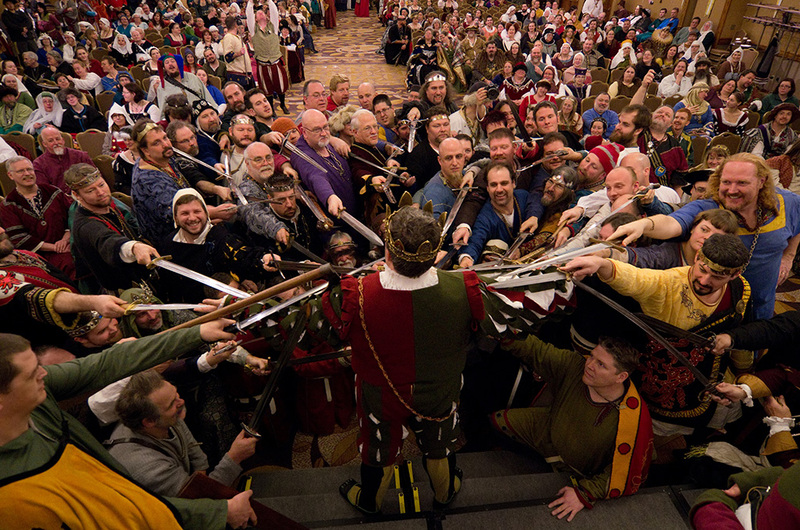 The Society for Creative Anachronism is one of the largest living history groups in the world, with over 60,000 participants. Founded in 1966, the group takes part in a wide-range of medieval-inspired activities, including medieval combat, feasting and recreating the look and life of people from the Middle Ages. Euan’s project evolved over the three years – at first he was interested in following his friend as he took part in the events and moved up the ranks of the SCA, but over time it became more about the entire group and the medieval battles they take part in. “I wanted to dig in and try to understand the feelings behind what’s going on, as well as to show a breadth of different aspects of the group,” Euan explains. As he watched and photographed these SCA events, Euan got to know the people who part in them, and he found them “just like everyone else. Going to an event, at least one where the fighting is the focus, feels to me like going to see a friend’s soccer or baseball game: there’s a field where the action is happening and it’s kind of the center of everything. But people are milling about and talking and their attention might drift in and out of the fighting itself. “Being out in the field during the army battles felt like playing paintball to me: there’s people running around, and I’m a bit scared, and I can’t see very well because I’m wearing a helmet, but it’s very exciting and someone could pop out of nowhere at any second. Then in the evenings people sit around the fire and talk and dance and drink and sing and play games. So the people there are the sorts of people who enjoy those things, which I think are pretty normal sorts of things to enjoy.